This is the third year UBI Taiwan held its international summit in Taipei to push discussion of basic income on March 16. 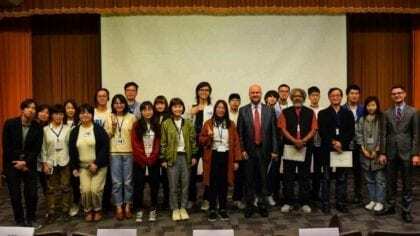 This year’s conference focused on the challenges Taiwan and the global economy is facing in the coming decade and what steps could be taken to make basic income a feasible solution. Dr. Sarath Davala, vice chair of Basic Income Earth Network, was the keynote speaker for the second year in a row. Davala said this year’s attendees were even more enthusiastic. “UBI Taiwan exudes unique energy and dedication to the idea of basic income. This kind of energy is perhaps rare in the basic income movement. Nowhere in the world, have I seen such critical mass of students collectively excited about basic income,” Davala said. Dr. Ryan Engen, an economic officer at the American Institute in Taiwan (AIT), the unofficial U.S. embassy in Taiwan, gave the opening speech for the conference. Engen said basic income is “perhaps the most promising policy” to address Taiwan and the world’s economic transformations. “If you can succeed in what you are trying to do, I actually think it has the potential to be the tipping point that changes the direction for the rest of the world, and that’s not an exaggeration,” Engen said. In justifying the need to explore basic income, Engen discussed how the return on capital has outstripped income, which has exacerbated global income inequality. The world is moving toward nationalism as a result of globalization and automation, which requires “creating a new global social contract that leaves nobody behind,” Engen said. Guy Standing, BIEN’s co-founder, provided a video message for the conference Taiwan. He said Taiwan’s activists should frame basic income primarily in human rights terms, rather than as just an economic policy. Standing said while basic income would reduce poverty, this should not be the primary focus of Taiwan’s UBI movement. “We must constantly stress the ethical basis of the campaign for basic income,” Standing said. In the final round-table discussion, Ta-Ching Shih, a Taiwanese economic specialist at AIT, said basic income activists in Taiwan must first get attention to the idea and then focus on the policy specifics later. Peter Knight, a former World Bank economist and a member of Fernand Braudel Institute of World Economics, also produced a video message for the conference where he discussed the economic rationale for basic income. Knight said Taiwan is likely to face high levels of job automation in the coming years, along with Japan, Singapore, and South Korea. Taiwan’s coming status as a super-aged society may also induce consideration of whether basic income could help alleviate this issue, he said. “UBI and progressive taxation to finance it, and the use of advanced labor-saving technologies are the key policies for Taiwan to achieve economic, social, political, and ecological sustainability,” Knight said. Professor Ku Yun-wen from National Taiwan University’s Social Work Department went through a detailed analysis of Taiwan’s welfare policies and discussed how basic income may fit into the system. Ku had previously written a report on UBI for Taiwan’s National Development Council, Taiwan’s Executive Yuan policy planning agency. Professor Fong from National Taiwan University’s Economic’s Department provided insight into some of the relevant economic trends to basic income, such as increasing automation and its potential impact in Taiwan. The conference was assisted in funding from the U.S. State Department’s Critical Language Scholarship through the Alumni Development Fund (ADF). Before Alan Krueger passed away, he discussed the prospects of basic income in Taiwan with James Davis, one of the managers for this ADF project. Krueger was the former chair of President Barack Obama’s Council of Economic Advisers. Professor Hou-ming Huang, the director of National Chengchi University’s Sociology Department, presented on the economic and philosophical transitions of humanity throughout history. A journalist from Taiwan’s magazine The Reporter spoke on the misinformation that is often spread in Taiwan and global media regarding basic income. Despite this misinformation, Davala said he is optimistic about the future of basic income’s development in Taiwan. “I am sure that the debate in Taiwan will progress beyond conference halls and to the policy corridors,” Davala said. Engen ended his remarks by noting Taiwan could play a very important role in the global UBI movement. Taiwan is a “melting pot” of international influence and is at the center of global supply chains, Engen pointed out. Taiwan is also the “most progressive example in all of the Indo-Pacific,” he said. In the run-up to the conference, Elyse Mark and Brian Anderson, who were also managers of the ADF project, produced interviews with U.S. scholars. Mark interviewed a legislative director for a councilmember of the District of Columbia council who produced a policy report on implementing minimum income in DC. Anderson interviewed an economist to understand the benefits of basic income across Taiwan and the United States. Davis also worked with Stanford’s Basic Income Lab to understand the context for how research there could help propel basic income frameworks for Taiwan.